Atlanta-based Captain Planet Foundation (CPF) has run a school garden program in the Metro Atlanta area since 2009. Last Friday, the nonprofit took the program on the road and delivered one of the first teacher workshops outside their home base. 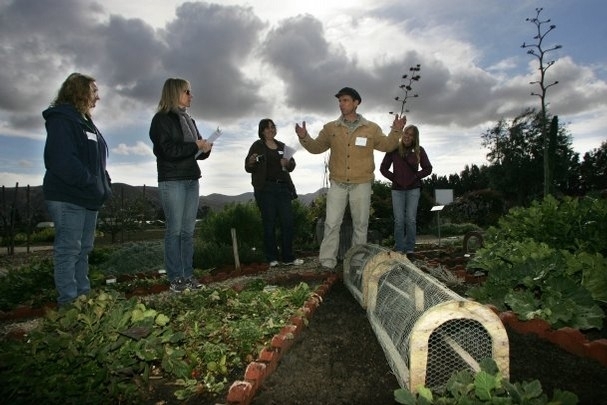 Led by Kyla Van Deusen, garden educator, CPF conducted a two-day training at HAREC. CPF is partnering locally with Food for Thought Ojai and organic compost company Agromin, to help install and maintain educational gardens at six Ventura County schools. Thirty educators participated in the training that covered how to create, sustain, and use gardens to teach environmental science. The teachers also learned how to use cooking and taste testing in the garden to reinforce nutrition, math, science, and language arts principles and vocabulary. CPF provided curriculum for K to third grades as well as cooking carts filled with basic tools to help teachers easily integrate the program into their garden classrooms. Captain Planet executive director, Leesa Carter-Jones explained that lessons and exposure to garden based learning will help students connect where and how food grows, local agriculture, and help develop a palate for fresh fruits and vegetables.